My clock was built from a kit made by the Colonial Times clock company in Eastern Canada. It is made of walnut and is a project in progress. It was not working when I bought it and so far I have the time keeping working well but need new weights for the chimes. The weights that came with the clock were the wrong size. I am having a lot of difficulty finding weights here in canada and will probably have to cast my own. Colonial Times is still in business, why not just purchase from them? Join in and write your own page! It's easy to do. How? 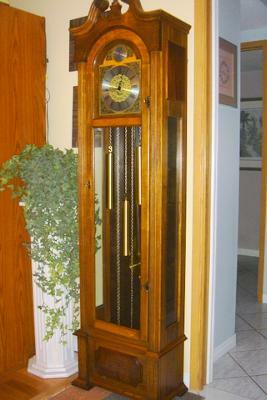 Simply click here to return to Grandfather Clock Kit Forum.